Sunday Night dinner at our home is a family affair. We share our home with my grandmother, and live across the street from my Aunt and Uncle and their two girls. My hubby has been begging me to make my "Gumbo" he knows I will only make it in the summer when I can buy all of the ingredients fresh from the market. I purchase my meat from our local butcher, Bedford Meat Shop. Amazing! Say hi to Justin if you are here in Lynchburg! I made this table cloth today and lined and inner lined it so that it would protect my grandmothers table. I just had it refinished. It is approx. 50 years old, not that old as far as tables go, but the polyurethane had broken down so every time I put anything hot on the table it left a white mark. I tried all kinds of fixes before I gave up and sent it to my wood worker's to be refinished. The pillows are from the same ticking, but cut on a diagonal and then sewn together to make squares. A tutorial on these beauties is soon to come! I did not make them today. The floral container is a candle mold, that both Kandi and I purchased on a shopping trip when we were in Asheville a fabulous store.... the Tobacco Barn. I will let Kandi tell you about that, she is the expert, and she will tell you I completely shut down, too much stuff! But before the crash, we spotted these sugar molds and instantly knew how we wanted to use them. They are great for an informal dinner because they are low, and arranging flowers in them is a piece of cake. 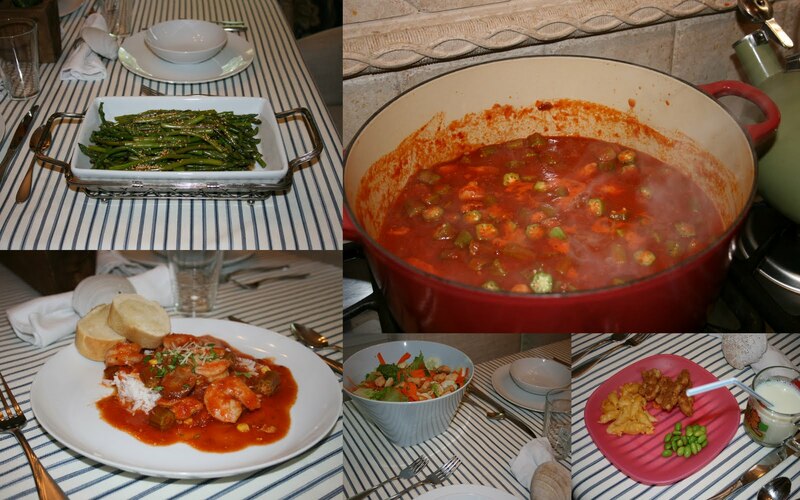 Hope you enjoyed these pictures, please share your favorite Sunday night dinner ideas with us! Notice the picture of the kids plate in the bottom left corner... lets face it... 2 and 5 year olds do not eat Gumbo!! I promise this is the only time they had chicken nuggets this week (wink). The table cloth, pillows, cushions, and curtains you see here were all designed and created by Woven Home. Contact us at wovenhome@hotmail.com for your free design consult!